Organic Valley’s young voices enthrall a packed house, twice. 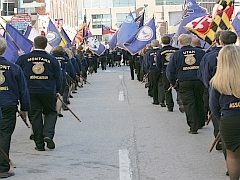 By noon on Friday of the three-day National Future Farmers of America (FFA) conference we had shook hands with and delivered our elevator speeches to thousands of FFA students, advisors and chaperones, and traffic was finally slowing down. Across the way, Organic Valley, with their large end-of-the-aisle double booth, had finally finished handing out their free organic string cheese that a hefty percentage of conference goers had enjoyed over the previous days. This gave us the chance to meet the farmer-partners manning the 20-year-old farmer-owned cooperative’s booth. Mariann Holm, a dairy farmer from Wisconsin’s Chippewa Valley, told us that her 17-year old daughter, Sarah Holm, would be giving a presentation entitled “Understanding Organic Agriculture” with fellow farmer-partner Preston Green that afternoon. After gathering pertinent details, such as in which auditorium the talk would take place in the labyrinth of convention center meeting halls, the other interns and I dashed off to grab a bite to eat. It turns out that 53,000 hungry FFA members can make it extraordinarily difficult to obtain a bite of lunch. Thankfully, Holm and Green were giving their presentation twice, so while our voyage across the convention center through the endless sea of blue corduroy jackets prevented us from seeing the first show, we were able to arrive half an hour early for the second round. Even so, the room was already filling up, and finding a table with three chairs proved challenging. Enthusiastic young farmers from Washington and Montana to Maryland and Arkansas packed every seat and every table and lined the walls until some poor fellow was assigned to turn people away. Chatting with Sarah, we learned the first presentation had been equally as popular. At 2 p.m. the lights dimmed and an image of a bucolic Wisconsin farm filled the screen. Young Sarah Holm and 20-year-old Preston Green took the stage to tell their stories. They opened with tales of their own farms and discussed why going organic had made it possible for their families to have family farms, to stay at a size that their families could manage, and to treat their animals the way they wanted to treat them. Pictures of the Holms’ 35 milking Jerseys and Sarah’s five younger sisters illustrated her message. Preston worked the crowd of his peers like a trained motivational speaker. In his narrative, he sought to bridge the divide between organic and conventional farmers. In extending the olive branch his main point was to say: Hey, we’re all farmers; organic farming is just one way you can choose to farm. With this open, all-inclusive approach he took the audience to his family’s 1000-acre Rebel Ridge Family Farm in Wisconsin where Preston, his dad and brother manage a herd of beef cattle. He walked FFA student attendees through a typical organic rotation, including organic-specific practices such as frost seeding cover crops, later planting dates and tillage. In the lively and extensive question-and-answer session following the presentation, we could hear and see how effectively Sarah and Preston had opened a world of organic possibilities to the crowd of skeptical young farmers. Holm and Green’s candid narratives sparked very specific questions from the audience. Clearly impressed by Sarah’s expansive knowledge of homeopathic treatments for all that might ail cows, many of the attendees’ questions honed in on problems they’d dealt with on their own farms. What about mastitis? What about retained placenta? What if an animal needs antibiotics? Sarah delivered a comprehensive and thoughtful answer to each question, grounded in her own experiences on the Holm family farm. The buzzing energy of FFA members who lingered long after the presentation and group questions had ended to ask Sarah and Preston more questions give me confidence that through sincere, heartfelt accounts and open dialogue, they had made a path for hundreds more future organic farmers in America. 1. Branovan, Carrie. “Meet the Holm Family.” Available fromhttp://www.organicvalley.coop/our-story/meet-the-farmers/heartland/meet-the-holm-family/ (accessed December 1, 2008). 2. Branovan, Carrie. 2006. The Heart of Farming. Available from:http://www.organicvalley.coop/heart/if-i-only-had-the-nerve/ (accessed December 1, 2008).